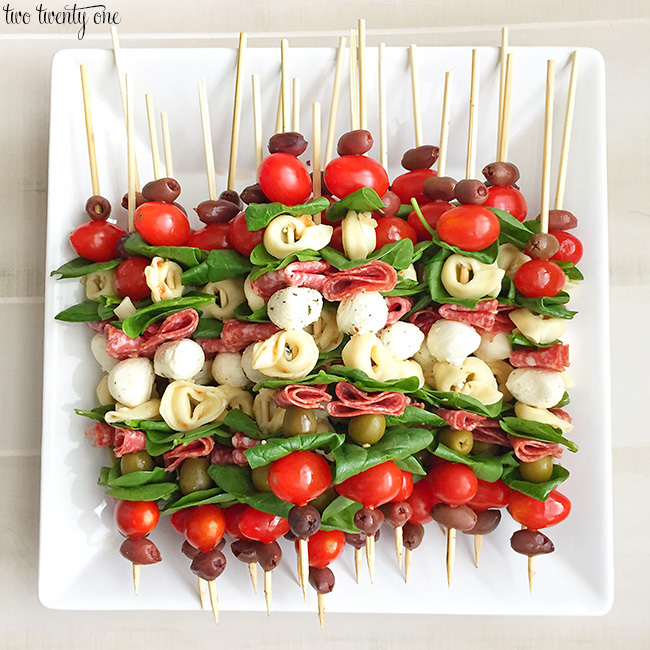 A couple months ago I shared a photo of the antipasto skewers I made for my friend’s baby shower that I co-hosted. I never planned on sharing how I slapped these puppies together because I figured it was self-explanatory. But someone asked again the other day so I figured it was best to put the recipe out there so I can direct people to it. I bought most of the ingredients at Trader Joe’s. The only ingredients that weren’t purchased there were the wooden skewers, salad dressing, seasoning, and the kalamata olives, which I buy in bulk from Costco because I have a kalamata olive addiction. 1. basil is expensive unless you grow it, which I don’t. 2. I’d rather eat a spinach leaf over a basil leaf. But you’re more than welcome to be traditional and use basil instead of spinach. You can stretch your basil by cutting each bigger leaf in half. You can also jazz these up a little more with a drizzle of balsamic glaze. I prefer Trader Joe’s. YUM. Cook tortellini according to package directions. Drain and rinse with cold water. In a sealable container, combine the tortellini, dressing, and seasoning. Refrigerate for 1-4 hours, stirring the contents a few times. Gather remaining ingredients when ready to assemble skewers. There will most likely be leftover tortellini so grab tortellini directly from the container and put it on the skewer. Fold the salami slices into fourths. Fold the spinach leaves in half. Thread the wooden skewer the following way: kalamata olive, tomato, spinach, tortellini, spinach, salami, cheese, tortellini, spinach, salami, green olive, spinach, tomato, kalamata olive. Keep in mind that you can cut this recipe in half or double it. I actually had some leftover ingredients so I through them into the container of marinaded tortellini and made a pasta salad of sorts. The nice thing about salads as that you can throw whatever you want in them. 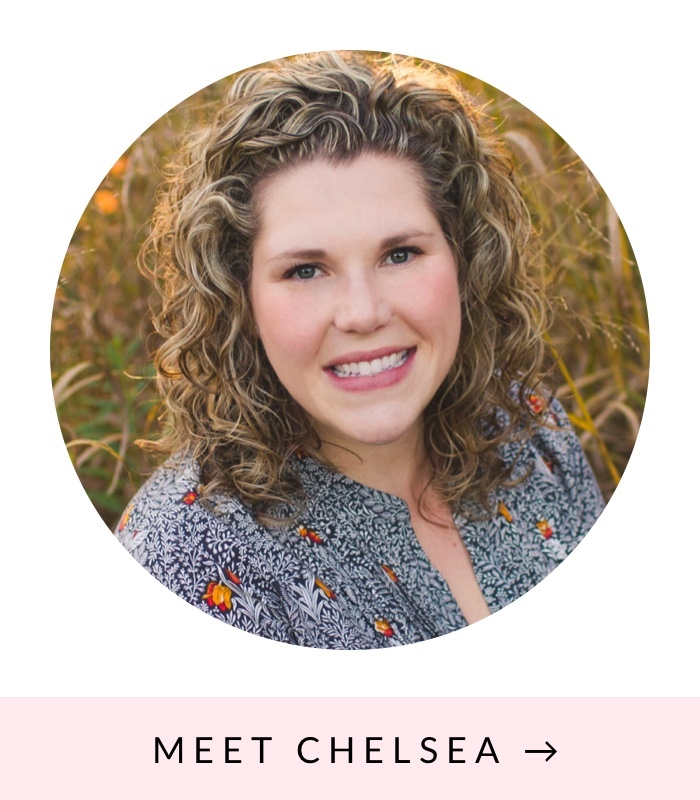 I’ve partnered up with 9 other bloggers to share some delicious recipes that are perfect for a picnic. So make sure you head over to their blogs and check out their tasty creations! I prefer spinach over a whole basil leaf as well! these are so pretty and sound amazing! I am not putting in tortellini- do you pour anything over them like balsamic? These look yummy and great on my diet! Oh my goodness! 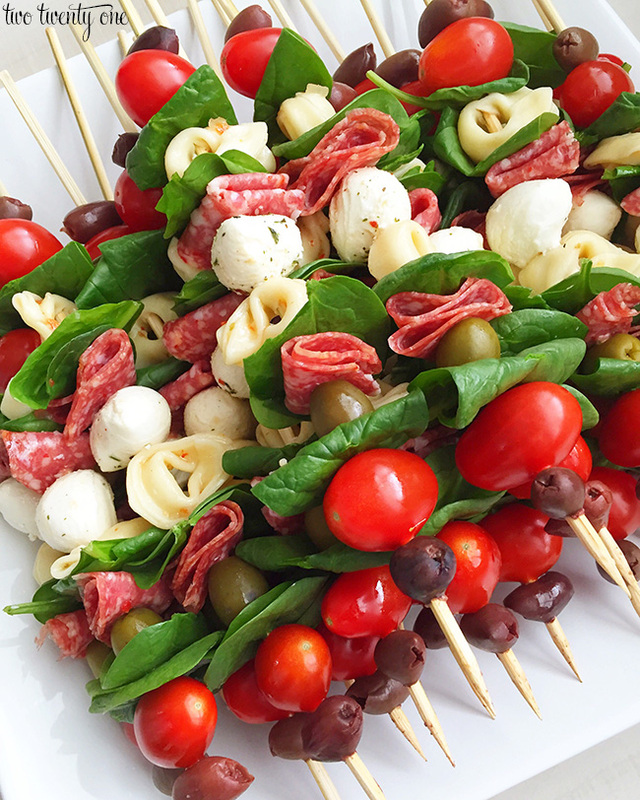 Your antipasto skewers look so YUMMY-and would be PERFECT for any summer gathering! Thank you so much for sharing at The Wonderful Wednesday Blog Hop! PINNING and sharing! Wow what a fabulous app! Thanks for linking up to Merry Monday! 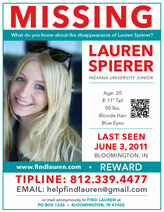 Pinned & Sharing on FB! Have a great week! Yummy. We love making antipasto skewers. I love how easy and fun this are! Thank you for joining the Delicious Dishes Recipe Party! These are gorgeous and look so delicious too! I would love it if you linked up this post at the Family Joy Blog Link-up Party which starts on Sundays at 12 EST on Ava’s Alphabet and 5 other blogs. Hope you are having a great weekend! Hi, Love this antipasto recipe! Perfect for my daughter’s baby shower I’m planning. Can these be made the night before? And any suggestions on what to serve with them? Shower is with 25 people, mostly women, only 4 men, LOL. Huge hit last Christmas Eve. Planning on doing them again this year. Can I make theses the night before my party, without the dressing of course.